1st April (Fools Day) saw Phil Wright tackling the infamous R25/3H in South Wales. However sub zero overnight temperatures meant the race started with a temperature of 2 degrees – meaning fast times were not going to be had for the early starters. Phil only acheived a 1:05 for the 25 miles the winner posted a 50 minute ride. 7th April was the Darlington 2 up , heavy rain meant a lot of entrants DNS, however Richie Grant and Darren Peart rode for a long 26 – in very grim conditions. 8th April was the T235 SPOCO round the Bishopton – Sadberg – Redmarshall circuit run by SWCC. James Kilpatrick (HCC) – DNF wrong turn. 15th April was the T091 x 2 SPOCO , twice round the Seamer circuit, Paul Fountain was the fastest HCC rider with a creditible 42:08 for a 10th overall place and 7th Teesside Affilliated. Mark Tinkler did a 45:03 for 28th (23rd Teesside), Richie Grant 52:12 and Phil Wright 52:29 completed the HCC entrants. This coming week we have our own HCC event on the T105 Sedgefield Course (roadworks permitting) on Saturday 21st April 2018 with first HCC rider off at 14:01 – Andrew Wilson with 7 other HCC riders competing. For the more hardier rider there is the T405 – the mountain time trial on Sunday 22nd with the three Pauls (Thirling.Fountain and Garstang) making up the HCC contingent of entrees. This Wednesday 18th April sees the start of the Club tens with the Darlington CC course near Croft being the first this season to see action. Remember any HCC club rider can turn up and enter on the line for the princely sum of £3:00. HCC members were involved in two TT’s over the weekend. 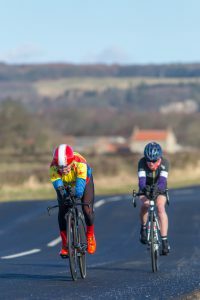 The first event on Saturday 24th March was the V226 at Boroughbridge, the 15 mile course record was broken by both the men’s winner and ladies winner, Simon Beldon ( Team Bottrill) in 30:43 and Fiona Sharp (Team Swift) in 36:11, respectively. HCC were represented by Phil Wright who managed 41:12 for 59th. Thanks go to Harrogate Nova CC for running a great event and ordering decent weather. The second event of the weekend was the SPOCO on T244/1 at Staindrop held on Sunday 25th March. Conditions were cold and a blusterly wind rose during the race making conditions hard in the last 5 mile of the 21 mile course. First Teesside Affilliated rider home ( 5th overall) was Hartlepool’s Cycling Clubs own Paul Thirling in 49:32, Paul Garstang did a 59:27 for 18th and Phil Wright in 1:06:11 for 23rd out of 41 entrants. Thanks to Teesdale CRC for running a safe and smooth event. Good to see Trevor Jones out supporting our lads. 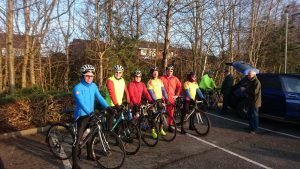 Next TT’s with HCC members participation : 1st April R25/3H in Wales, 7th April T103 Darlington 2 Up TT and V236 VTTA 25 on A19 and 8th April Stockton Wheelers SPOCO on T235 at Bishopton. 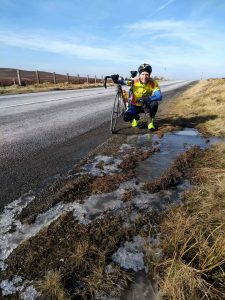 Richard Booth starts his 2018 campaign in a TLI Road Race on 8th April. Entries are now being accepted for Hartlepool Cycling Clubs first event of the 2018 season. Either post hard copy to Phil Wright,265 Stockton Road, Hartlepool TS25 5AU or via CTT website. Remember entry for current HCC members is FREE, for none members it is just £10. March 11th was the first race weekend of the season following the cancellation of the V910 on 4th March. 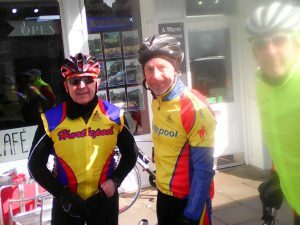 Hartlepool CC were well represented at Cleveland Wheelers T211R a SPOCO starting and finishing close to Stokesely. Its a tough start to the season and bound to be cold at this time of year. New member James Kilpatrick’s first race for HCC was really just an intro and he was still getting used to ‘his aero position” and was using the race as an experiene whereas established TT racers, Paul Thirling and Paul Fountain were looking for early points in the Teesside SPOCO league. After a previous spill in last years event Richie Grant was just looking for a clear round, he wore his old Skin Suit just in case. Richie Booth’s season is yet to start his first event being a TLI RR near Clitheroe on 8th April. 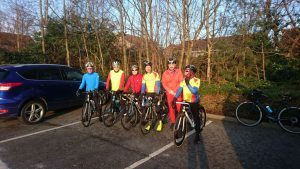 Hartlepool Cycling Club have had a long standing tradition of riding 100 miles in 8 hours. Early season whilst the snow is still on the ground. 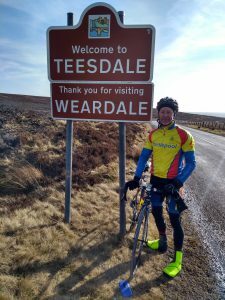 The ride used to start in Hartlepool, going up to Consett, left at B6278 over to Stanhope, then over Bollihope, Egglestone, Staindrop and back to Hartlepool. 7000 ft of climbing including 10 categorised climbs. For many years it had not been done and many of the old school maintained that HCC present members were not tough enough or capable of doing it ! Incoming Secretary (new school ) accepted the challenge and drummed up a team. The team was to be , HCC members Paul Garstang, Phil Wright, Trevor Jones and Andrew Wilson (combined age of over 220 years) . Jason Lewis would join along for the first 25 mile or so . Plus two guest riders , Ian Sime and Paul Clarke would also participate. The support vehicle would be manned with John Parsons and Neil Stuart (Old School) and George Wilson popped along to see us off. Trevor was last man at the meeting point , he had decided he was up for it having an “off “just 2 days earlier !!! We set off at 08:10. 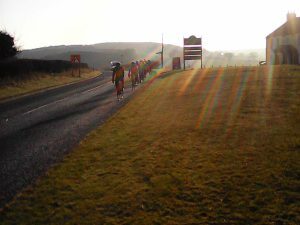 As arranged, Jason headed back at Consett , the remaining 6 pushed on with Trevor doing an epic descent through Castleside and missing the left hand turn onto the B6276. Paul went on to retrieve him whilst the team awaited in anticipation of the first real climb. They were not to be disappointed. Pretty soon after they were climbing out of Edmundbyers and over Skaylock hill (408 metres) and Collier Lay (516 metres) , it was decided at a point around here that we would have a cafe stop at Stanhope which proved far to early, as all the hard work was still in front of us. Refuelled the team set off to tackle Bollihope and it was cold, lord it was cold, there was ice and snow in abundance and if it was not hard enough , sheep dodging made it worse. The constant battering of an Easterly head wind , picking up as the afternoon wore on, made it grim too. After 5 1/2 hours of slog we got to the other side. Well after Hammsterley Common the ride back to Hartlepool is fairly unspectacular however the last 35 miles hurts after all that climbing. The 4 HCC team to complete this epic all did in in less that 8 hours (between 7:20 and 7 :40) – at an average of around 14 mph – does not sound too hard – try it next year if you like !! Thanks to all HCC participants, John and Neil and George and Jason for the support and to our two guests Paul and Ian who joined in the fun. Hartlepool Cycling Club tradition restored. “I was one of the sceptics who doubted the ability of the modern rider. After observing the ride in the comfort of Phil’s car my attitude changed completely. Even when some of the riders were obviously struggling my invitation to hang on to the door handle was refused. My only other comment is about the low gears that seemed to be used on average hills then the same on the steepest. This seems to be the modern way of riding. The weather helped a lot, you got the date right with what we have today.